Innovation has been recognized as a powerful engine for development to address social and economic challenges and steer global concerns for policy makers and citizens alike. Innovation is also essential to accelerating digital transformation and fosters the sustainable growth for the digital economy. BDT Innovation service supports ITU memberships to foster digital transformation through ICT entrepreneurship and increased ICT innovation in the ICT ecosystem, while encouraging empowerment of grassroots key stakeholders and creating new opportunities for them in the telecommunication/ICT sector. This also includes building a culture of innovation in the ITU membership to foster ICT entrepreneurship, ICT SMEs, startups creation and scale-up. 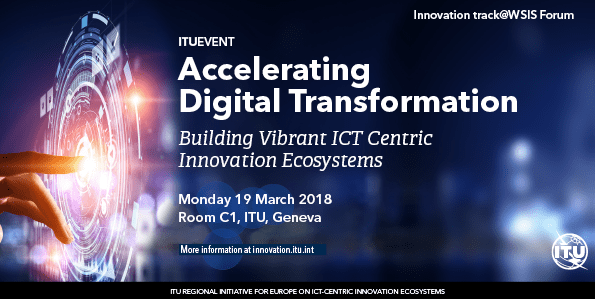 The ITU Office for Europe is specifically tasked such needs through the Regional Initiative for Europe on ICT-Centric Innovation Ecosystems defined at WTDC-17. All presentations of the Innovation Track now accessible via our dedicated Innovation@WSIS site.